Let’s take a moment to recap and reflect on the month of March. Our Green is the colour of life, renewal and rebirth. It renews and restores depleted energy and is associated with growth, harmony, freshness and safety. March Reflection: We continue to honour as a team our pledge to support Batyr through our HCG Elephant Fund and our total donations have reached $2,185.00 since 1 January 2019. For those who missed out our previous reflections, batyr is a for purpose preventative mental health organisation who visit schools, workplaces and universities to talk about mental health and erase the stigma that is all too often attached to mental health. As part of HCG’s colourful year plan we decided to give back to the community by pledging to support such a wonderful initiative like batyr. Mental health effects everyone, no one is immune to it and we believe preventative care and early intervention is the best way to help a person see that it is okay to not be okay and that it is okay to speak up and ask for help. You can follow the below links to see our full pledge, donate or see how HCG is progressing within their support to batyr and mental health. As a new initiative we are looking to introduce the One Sock program and encourage young school kids to embrace this program. We also sponsored a charity organisation set up by one of our clients who raises money through marketing and events such as fundraiser magazines which HCG has the pleasure of being a part of in April. The money raised helps to build hospitals and research centers to provide free medical treatment and examinations for those who otherwise would not have the sufficient funds to get medical help. We are proud that more and more of our clients are dedicating money and help to good causes they support by establishing and running registered charities not only in Australia but overseas too. Our White is the colour of perfection, purity and brilliance. To us, White means new beginnings and opportunities and inspires us to be creative in developing and offering innovative solutions. March Reflection: Hall Consulting Group is always looking at ways to be environmentally conscious and constantly promote a paperless office. We are one step closer to bringing an easier, time efficient and multi-functional portal to our clients as we start trailing the new portal internally to correct any bumps in the road before we roll out this new system to clients. If you are currently using Nimbus client portal and would like to provide feedback or you would like to be considered for the trial of the new system please e-mail our admin team at admin@hallconsulting.com.au. We are proud to announce that our firm has become the major financial sponsor of the Chatswood Junior Rugby Club and we addressed the parents and keen young rugby players at the season opening event this month to introduce our firm. We were delighted to meet the management team, coaches and other sponsors and are willing to commit time and effort to get more involved in the community, get to know the members of the Club better and run educational seminars for them on various topics of their choice. And finally, we complete our March reflection with the colour Red. Red is the colour of fire and blood is associated with energy, strength and power. It is also the colour of passion, desire and love. Red will illuminate our year ahead and reaffirm values such as leadership, courage, vigor and determination. March Reflection: Our Red was marked by the red rose 🌹 that brightened the desks of the women in our office and the pink party in the office boardroom to celebrate the 8th March – the International Women’s Day. 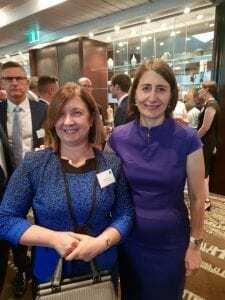 The power, determination, commitment and success of women in business and politics was validated by the win of the first woman to be elected as the Premier of NSW – the leader of the Liberal Party, Gladys Berejiklian, at the state election last Saturday. We are very proud of Gladys’s incredible but well deserved achievement and some of us treasure meeting her personally as she is such an inspiring leader. Our team is back to study, the junior accountants are back to University to tackle the new semester in style and a senior team member courageously commenced the CTA module at the Tax Institute. Good luck, Fiona! One of our core values as a team is being Focused and Progressive and this is demonstrated by our commitment to learn more and be better at what we do. If you wish to acknowledge our team’s effort to help your business or you personally, please kindly provide a review on Google. We always have the best interest of our clients in mind and are open to improving and implementing positive actions. We are determined to live our values, embodied in our Green, White and Red colours of the year, through our work and dedication.